Your teeth, like the earth we walk on, are prone to erosion. A 2015 poll from Yale University Rudd Center For Food Policy and Obesity study found that a majority of Americans understand that soda is bad for them. However, as many as 48% are estimated to drinking soda on a daily basis. How much soda? A poll suggested as many as 2.6 glasses per day! Your tooth enamel is the hard outer surface layer of your teeth that helps protect against tooth decay. Did you know that your enamel is the hardest mineral substance of the body? Fact. It’s even harder than bone. A major enemy of the enamel are acids. There are natural occurring acids, which you can combat through regular dental and oral care (ask Dr. Rob about this). But then there are things such as juices, citrus fruits, pops and other food items which can batter the surface of the enamel, softening it over time. That’s not to say you shouldn’t drink an iced cold soda, from time to time. I mean- there’s really nothing more refreshing than a Coke to wash down a burger or a slice of cheesy pizza. 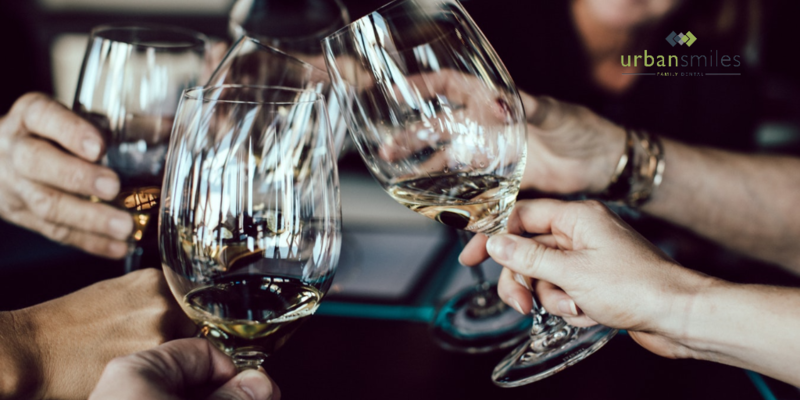 But like the greasy food you’ll likely pair the soda with, you should limit your consumption and instead opt for a more teeth sensitive beverage option. Another cause of erosion is the grinding of your teeth. Perhaps it’s stress-related, but many people grind their teeth in their sleep, without realizing they do, which can lead to cracked teeth and erosion over time. It can also cause jaw soreness, headaches and other ailments. Not to mention, a disturbance in the quality of your sleep. Preventative measures, such as a fitted mouth guard to wear during your sleep, can help counter the wear and tear on your teeth. It’s important to schedule regular check ups to ensure your teeth are in good shape. Our diets may change, our stress levels can change, and even if you don’t think you’re prone to erosion, that may have changed since your last checkup. Have you ever tried a drugstore whitening strip? If you have, you’ve also had to try removing one- a challenge, right up there with picking a wet watermelon seed off of a kitchen floor, and of course- “the cinnamon challenge”. It’s sticky, and seems to dissolve in the bed of bleach froth that accumulated after a recommended 30 minute session. Placed incorrectly, the bleach can irritate gums— likely to happen, since these are a one-size-fits-all model, and not custom to the user. Have you ever used a tray— custom or otherwise- for teeth whitening? I’m talking about either the overnight model, or the wear during the day model. Have you? 30 minutes or more where you won’t have to speak with anyone and can walk around with a tray in your mouth, full of bleaching gel? Oh- and by the way, you’ll need to do this for multiple treatments, on an ongoing basis throughout the year for maintenance. The gel can also be quite costly. Can you find them cheaply online? Of course, but at what cost? Are the materials or the solution balances safe for prolonged usage? Would your dentist approve of them? Have they been approved by the Canadian Dental Association, and other regulating bodies? Probably not. And again, they’re inconvenient, and they can be quite uncomfortable. 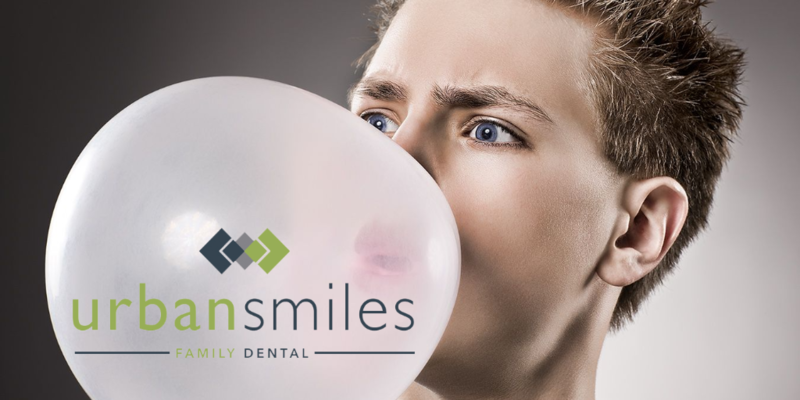 Since you will want more immediate whitening results, and you’ll want to do it in as few sessions as possible, with the least amount of inconvenience or discomfort, I would suggest speak with your dentist or hygienist about Zoom. White teeth are attainable. You don’t need to have to wear uncomfortable trays while you sleep, schedule time each day to wear trays, or have to peel away sticky strips from your burning gum line in order to have them. 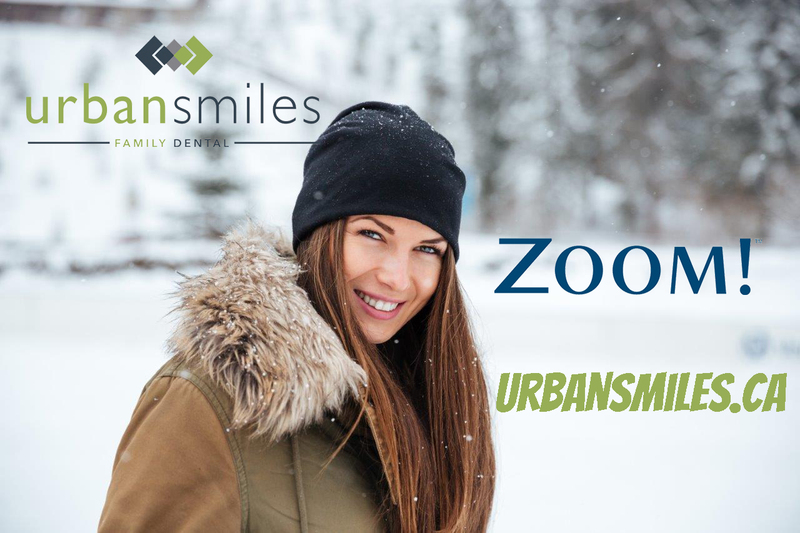 Zoom Whitening is available at Urban Smiles. When you smile less, people take notice. You will be less likely to break the ice with people, interact with new people, and you will seem less engaged in conversations. You’ll appear distant, withdrawn, or even disinterested. It’ll reflect on the overall satisfaction of your customers, if you’re in a customer facing role. 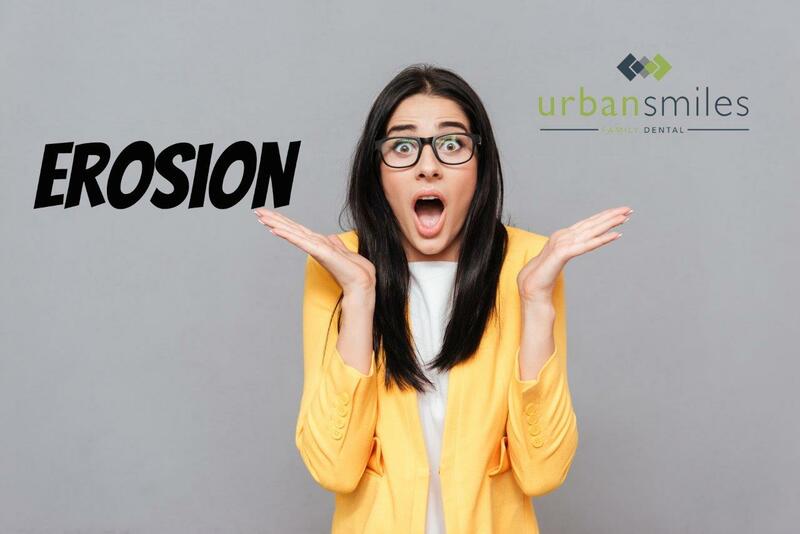 It will affect the environment of your workplace, bringing down overall morale with it— and subsequently, your Yelp reviews or CSI scores… ok- so maybe that’s a little hyperbolic, but you get the point. The Butterfly Effect, Laws of Attraction, etc., etc. These doldrums can bleed into your personal life as well. People want to be around other people who seem like they’re having a good time… people who seem to be enjoying life. It’s contagious. We want to be a part of that— not apart from it. Why aren’t you smiling? Major mental health initiatives, such as #Bellletstalk, have recently trended through various media outlets and forums, but that shouldn’t preclude us from continuing to discuss such matters. After all, we see Dr. Rob for our teeth. Shouldn’t we see someone for our hearts and minds? Hopefully, the reasons you— or an acquaintance- aren’t smiling as often, aren’t due to something more deeply-rooted than a surface issue. And if that’s the case, we’ve got you covered. You likely have a beautiful smile. Lets us help you rediscover it, so that you can show it to everyone. We are all unfinished versions of our best selves. 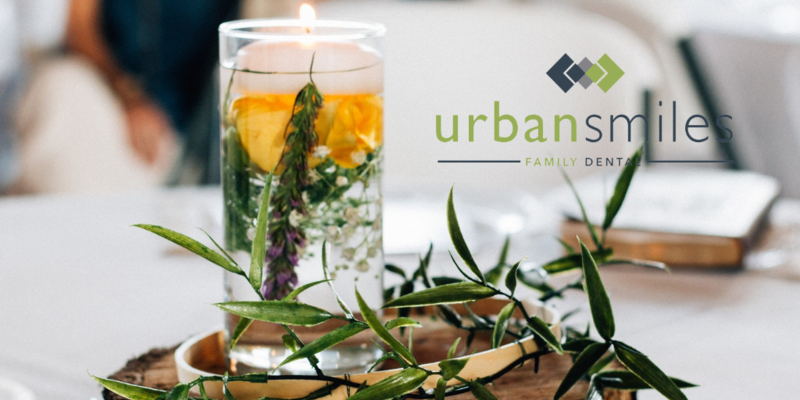 A quick refresh will allow you the opportunity to take that next step with your public appearance, as you deliver that next presentation, speak up at the next meeting, or give cheers at your next social event. Smile. We’re all better when we do. Science. Facts. Research. Don’t worry about it. The point is- you need to do it. Your dental care (possibly your friendships) depends on it. “Toothbrush can’t reach?” Right. Between the teeth, and in the depths of the gum line. Imagine this: you ate a great dinner. Steak, potatoes, vegetables… perhaps a salad beforehand. You finished with a nice piece of chocolate cake. A leisurely brushing preempted bedtime, and you headed to lala land for an 8 hour slumber. Eight hours for the left behind food particles- of which their are many, no doubt, after the steak, romaine, and the rest of your smorgasbord compounded itself into an oral compost. Your mouth- akin to a Petri dish- with a full classroom of bacteria, present and ready to show you how to lose friends and alienate people. Now what does that do to your mouth? Your breath? If you had flossed, prior to brushing, the cleaning agents in the toothpaste and the mouthwash after, would better be able to eradicate any of the would-be bacteria that would otherwise be present. You would wake up fresher, with a mouth less likely to be at risk of plaque, gingivitis or other ne’er-do-wells. Flossing is so very important. And today, you’re not restricted to the conventional flossing methods, as other options are plentiful in the marketplace. 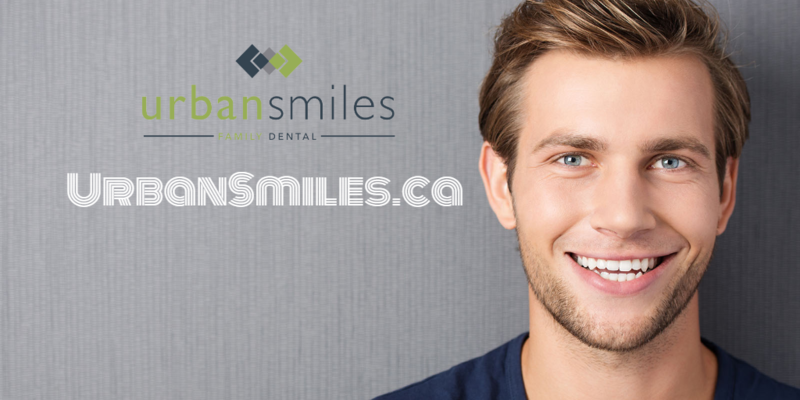 Ask your dentist today, for a solution that would work best for you. 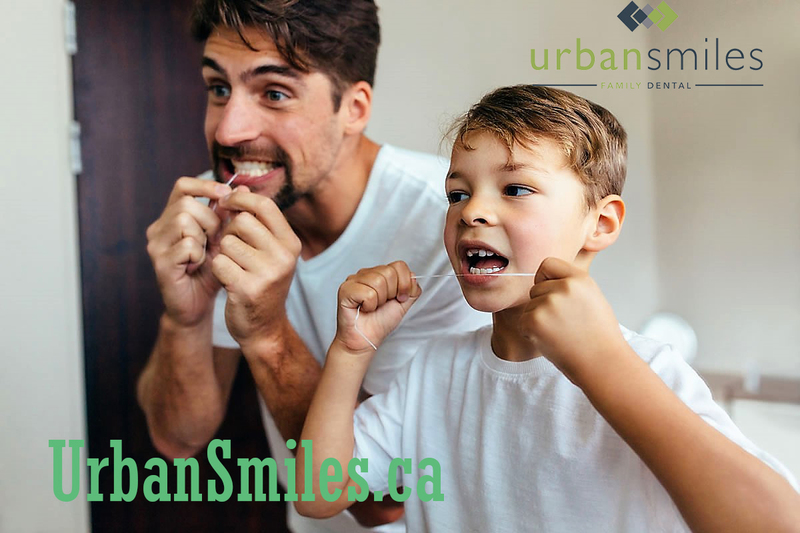 Flossing could easily become a part of your routine. Try it today. Some of the Best Teeth Chomping Foods! People often ask “what are the best foods I can eat for my teeth?” and while the candy company wants us to say “CAKE” or something, ok maybe you want that too, we just can’t say that. HOWEVER there are some decent foods that most people like that promote great teeth and mouth health, not to mention benefit your bodies as well! Cheese! Might as well start strong right? Cheese is obviously loved by many people, and fortunately for those people, a study published in the May/June 2013 issue of General Dentistry, the journal of the American Academy of General Dentistry, reported at EurekAlert! found that eating cheese raised the pH in the subjects’ mouths and lowered their risk of tooth decay. There are a few reasons why, but let’s just eat the cheese already! Fruits, such as apples, might be sweet, and we can’t eat too many of those things, but apples are high in fiber and water which when chewed produces saliva which can rinse away bacteria and food particles! And when you can’t brush right after a meal an apple could be your next best choice! 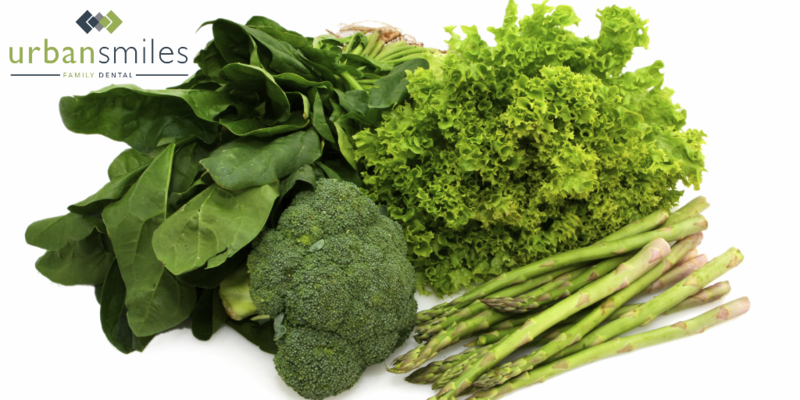 Leafy greens, ya ya, we know that this is the boring one that every good food list has… Leafy greens such as kale and spinach also promote oral health because they are high in calcium! It’s not just milk that has calcium contrary to popular belief! There are a number of great food choices that can promote a healthy mouth, and we cannot forget to overlook one of the most important parts of our bodies! It also may be that time to give Dr. 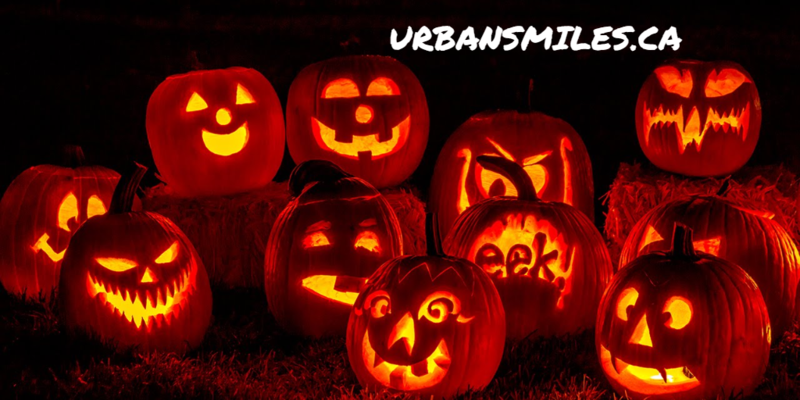 Rob Andrew a call at Urban Smiles Family Dental! He can’t wait to see you!